"Recently we had a chance to build a Blinky POV from Wayne and Lane. Or more accurately I should say she had a chance to build it, since my role was limited to talking her through the steps and taking photos. 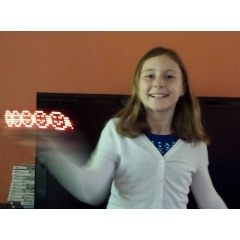 It’s impressive what an 11-year-old can do with a soldering iron!"